In my experience, the reason most likely to give owners the impression that their dog is spiteful is a disorder called separation anxiety (SA). SA is a complex disorder often marked by a dog’s extreme social attachment to their owner. Though it is recognized as a common disorder in dogs, it is not always straight forward to diagnose. Interestingly, many of the dogs with the disorder are otherwise very emotionally stable, friendly, and unproblematic in the presence of their owner. However, when left alone, often become anxious, destructive, and physiologically panicked as if their doom was imminent. Surveys have discovered approximately 14-20% of dogs regularly show signs of SA and up to 50% show signs at some time in their life (Sherman and Mills 2008). The specific behaviors associated with SA vary significantly by individual. However, there are several general signs that are seen among many affected dogs. SA has been described as a “behavioral disorder of dogs when left alone or separated from their owner” (Sherman 2008). Though not an exclusive SA diagnostic criteria, many dogs suffering from the disorder are also described as being “hyperattached” to the owner. They often follow their owner from room to room in the house, consistently lean or lie on the owner, beg for their owner to hold them, and make significant effort to sleep with the owner. In addition, these dogs frequently show signs of distress in response to the owner’s departure cues and show over exuberant and prolonged greeting behavior when they return. Owner’s departure cues include picking up car keys, changing clothes or putting on a coat, or even verbal cues such as saying goodbye. Signs of distress to these cues can be obvious, such as restless or excitable behavior in which the dog runs about frantically or becomes clingy, hyperventilation, or excessive salivation. Other dogs become reclusive and hide when they know their owner is leaving. A small subset of dogs even show aggressive behavior directed at their departing owner by biting the owner or the owner’s clothing in a seemingly last ditch effort to prevent the impending separation. When owners of affected dogs return home, they may be faced with a dog that will not settle down, jumps on them, barks and howls, or shows other excessive greeting behaviors that continue for much longer than would be expected from most dogs. Once the owner actually leaves the house, all bets are off in predicting the actions of a canine SA sufferer. Severe distress tends to occur immediately upon the owner leaving with variable decrease in severity over the period of the owner’s absence. Destructiveness is a common finding in SA. 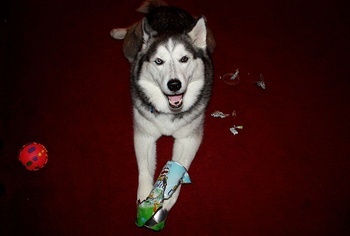 Dogs will often chew up or damage items marked with the owner’s scent such as clothing, bedding, and furniture. In addition, they will often damage the door their owner exits from or the window they use to watch the owner leave. Some dogs break off teeth or otherwise hurt themselves by trying to escape from their crate or kennel. Despite being housetrained, affected dogs often inappropriately urinate or defecate in the house when the owner is gone, sometimes even eliminating in their crate or bed (an unusual behavior for most dogs). Diarrhea is a common finding in these situations, likely due to the physiological changes associated with the extreme stress of the separation. Destruction has been linked to inappropriate exploratory behavior in an effort to find the owner (Appleby and Pluijmakers 2003). Some dogs only participate in destructive, self-harming behaviors such as excessive licking or chewing of limbs to the point of creating sores and infections. In addition to destruction, dogs with SA often vocalize loudly after their owner’s departure. These barks and whines are often of higher pitch and different character than their normal vocalizations and are similar to distress calls of puppies (Appleby and Pluijmakers 2003). Unfortunately, many owners living in apartments or in houses with close proximity to neighbors end up getting rid of their dog due to their neighbors’ displeasure with the loud and unrelenting vocalizations. It is not unusual for these owners to have run-ins with animal control authorities or law enforcement due to the noise. After making sure that medical causes of behavioral woes have been ruled out, veterinary behaviorists’ first step in SA treatment tends to be education of owners about their dog’s maladaptive behavior. Therapies for this disorder revolve around decreasing the dependence of the dog on its owner through modifying the owner’s response to attention seeking behaviors, creating a safe and comforting environment to leave the dog, and desensitizing the dog to departure cues. In addition, medications in combination with behavioral therapy have been shown to be particularly helpful in controlling SA (Sherman 2008). Two antidepressant medications, clomipramine and fluoxetine, are approved for treatment of SA when combined with behavioral therapy in dogs. In private practice, I saw several SA success stories using this approach. A board certified veterinary behaviorist is a fantastic resource for therapeutic options and can prescribe medications if they believe they would be helpful in a given case. Unfortunately, there are fewer than 60 veterinary behaviorists currently working in the United States. If a veterinary behaviorist is not available in your area, general veterinary practitioners and certified dog trainers are other helpful resources. The role of SA in the relationship between an owner and their dog is a destructive one. Owners often develop anger toward their animal and the perception that their dog is getting back at them for leaving the house. Unfortunately, punishments directed at your dog are not only unhelpful for SA, they can also induce more anxiety and fear, thus making the problem worse. Getting behavioral therapy for your anxious pooch can dramatically improve the human-animal bond you share with your dog and prevent you from having to make painful decisions in regards to your dog’s living arrangements. Although SA behavioral therapy requires commitment and patience by the owner to reach the desired endpoint, it can help convert your anger to understanding and through that understanding change anger back to love for your anxious (not spiteful) canine! Appleby D, Pluijmakers J. Separation anxiety in dogs: The function of homeostasis in its development and treatment. Clin Tech Small Anim Pract. 2004 Nov;19(4):205-15. Sherman BL. Separation anxiety in dogs. Compend Contin Educ Vet. 2008 Jan;30(1):27-42.